Should Offset Printers Diversify Into Digital Wide Format? The concept of an all-encompassing Print Service Provider (PSP) has been around for several years but few have embraced the one-stop-shop concept successfully. Segmentation of printing processes is culturally ingrained from the days of Duplicators, Small Offset, Big Offset, Web, Flexography, Gravure, Screen Process, Photo-chemical and if you want to go back far enough; Letterpress. With the advent of digital print, came the democratisation of process outputs. Digital unifies and breaks down barriers to entry into markets previously considered taboo – a large sheetfed offset printer would once never have considered becoming a Screen process printer as well, unless by acquisition of a going concern business. With most workflows all-digital today, it has never been easier for an offset printer to re-format design files to an output device, other than the computer-to-plate setter. But should they want to? Of the multiple possible printed outputs that a PSP can offer, perhaps digital wide-format printing makes the most sense – after investment in a digital sheetfed printer. Digital sheetfed takes care of the customers asking for short-runs of existing offset offerings, printed on-demand and maybe with variable data. Most customers would not be aware of which process was used to produce the job; one day they ask for 10,000 copies and the next day they want only 100 and it just happens somewhere inside that darkly mysterious place called a print shop. 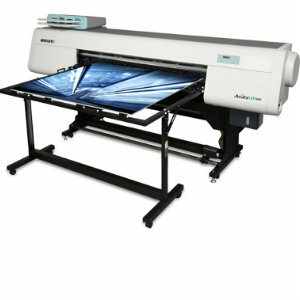 With wide format digital, an offset printer can actually change the perception of their business in front of customers. Suddenly, the friendly firm that printed the 500,000 catalogues can also supply the cardboard or foamboard merchandisers into which they are displayed for people to help themselves. Not only that but the colour management is consistent and the shipping can be to multiple retail destinations as one order – catalogues and promotional merchandiser - shelf talkers too if you want. To accomplish this, an offset printer would need to have a flatbed UV printer capable of printing on rigid materials and a flatbed die-cutter to cut out the board. The prepress side and CAD cutting program are easy, with most knowledge already existing within a CtP-driven offset business. Total investment for quality equipment can start from around $400,000 – contrast this with the purchase of a 162, 180 or 205cm offset press plus a heavy platen die-cutter; that’s likely to be in the $5 million plus area. Sure, the big KBA, Roland or Heidelberg will be faster but the trend is increasingly towards short runs with fast turn-arounds and short set-up times. This is just one example of how an offset printer can increase order value. Once installed, a flatbed UV printer finds all kinds of other work from plain ‘boards’ produced by the hundreds to be hung in malls or displayed in stores, to cut-out standees and even decals printed on plastic materials. Fujifilm’s Speciality Inks division even has flexible inks that can be thermoformed on plastic for signage. Fujifilm’s Acuity and Onset flatbed UV range is perhaps the broadest of all, from 25 to 725 square metres per hour productivity range. Apart from flatbed UV presses, there are roll-feed machines for banners, posters, building mesh wrap and billboards. Some flatbed UV machines can be fitted with roll options but generally it’s better to separate flatbed and roll production. Fujifilm’s roll-to-roll printers start at 1.6 metre width and go all the way up to 5 metres with the Uvistar. They all use UV curing of Uvijet inks made by the company in the former Sericol factory in England, so the printed results are vibrant, durable and scratch-resistant. Most offset printers will be using roll-feed aqueous wide format for making proofs and imposed signatures. These are precision-calibrated to match the offset press colour gamut. Colour management on non-proofing wider machines is also very precise, and can be matched to offset presses if needed; meaning a printer can offer the same looking posters and promotional banners to go with the offset printed products. Every business with a branded product to sell uses labels, and short digital runs of self-adhesive labels are the fastest growing sector in the graphic arts right now (source: smithersPira survey). An offset printer does not need to become a flexographic or gravure printer to make labels. A wide-format printer can print any label design, stepped across a 1600mm roll of self-adhesive vinyl, which is then taken to a contour cutting plotter for ‘kiss-cutting’ ready to peel off. Fujifilm’s Acuity 1600LED even offers white and clear ink options, so transparent labels can be printed in brilliant colour with the white ink underneath and spot varnish effects can embellish the look of the UV-cured labels. The best news is that profit margins from wide-format output can be significantly better than those found in the increasingly commodotised offset sector. The volumes may be lower but printers who have diversified, such as New Zealand’s Benenfitz, have found the profit contribution from wide-format digital – a Fujifilm Uvistar Pro8 in their case – just keeps rising. So, should offset printers consider wide-format digital diversification? Well, they say the easiest customer to sell to is the one who already buys from you; why not offer exciting new wide-format printed products to your existing client base for starters?